Every Wednesday, the most generous Rochelle posts a photo-prompt and challenges writers from around the globe for their own 100-word take on the picture. This challenge is known across the world as the Friday Fictioneers. 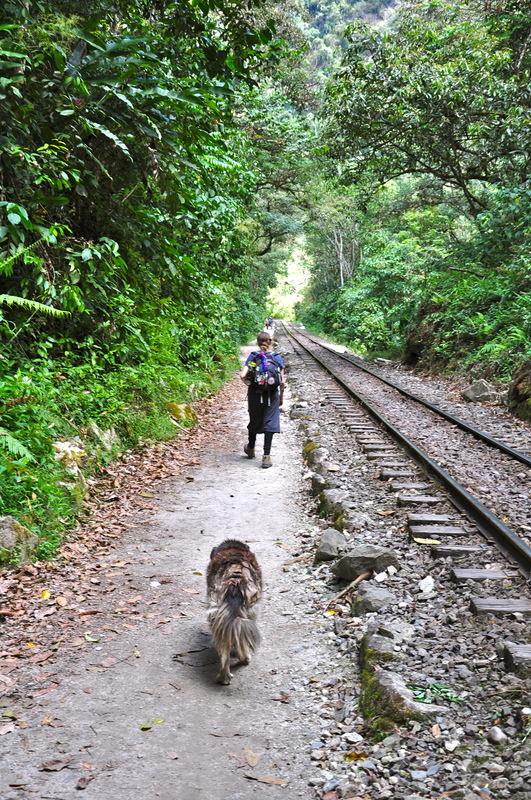 Along the tracks, in that wild envelope of green, Whitley could go five miles without remembering. She could pretend that she and Beau were just on a hike, like those East Coast tourists used to do in their $300 hiking boots and their dryer-fresh socks. Laughing, taking selfies and imagining themselves frontiersmen. There was nothing like that now. On the highway, every other mile-marker fell to a tangle of kudzu and broken cars, the mummified drivers still propped behind the wheels. And those tourists? Rotting in their beds in their homes far away. These days, she kept to the tracks. PS: Microsoft Word counts hyphenated words as a single word. But does Rochelle? If not, I get two demerits. I love the “Thanks for visiting!” at the end. You crack me up. This is one spooky hundred words. Nice work. I do come off as awfully happy about all that doom and gloom. Powerful imagery. Bleeding contempt in the second paragraph; proving it’s warranted in the fourth. Enjoyed this one… feeling the dark side this week. Thanks Kimberly! Is it dark in here or is it just us? A very good post-apocalyptic tale. The nostalgia for days gone by was very effective. Thank you kindly and thanks for the visit Helena! That’s maybe because the only quality time I get with my teenage son is talking about Walking Dead. The railway tracks feature big in that. Anyway, I didn’t let any zombies in my post apocalyptic party. Thanks for visiting Sandra! I love post-apocalyptic fiction, so I did a little secret internal squeal of glee when I got to that line about mummified drivers. I like this piece a lot. I got a squeal of glee that it resonated! Thanks for the kind words. Very eerie! I would like to know how she escaped the horror. You have me wondering myself. Post apocalypse done in a very subtle yet effective style! Whew. Keeping to tracks seems like a good idea in that world. I hope they stay away from Terminus. I like the story, pretending to survive. Nice work. It took me a couple of reads to realize this was post-apocalyptic. Nicely done and thank you for not inviting Zombies. We had a rash of them for a while and I don’t miss them at all. The image of people mummified in their cars, however, is powerful. Wow .. there are but few survivors afterwards.. really a surprising end..
if anything, these folks died what they loved doing. Oh creepy. I love a good post apocalypse story. Thanks for sharing. That is one spooky story. Five miles without remembering the mummies in the cars. I don’t think I’d be able to go 5 feet. And the big question why did she survive and for how long? Loved it. Nicely-rendered post-apocalyptic story. And in the attempt to answer your question, I think the hyphenated words count as one. The hyphenated words seems-like-a-slippery-slope, but I’ll happily take it on this one. Thanks for reading and commenting! Well imagined and expertly rendered. The story has legs and you might want to file it away for future development. Very effective! I’d enjoy a sequel…. I’ve never tried writing any post-apocalypse stuff – too much John Wyndham force-fed to me by teachers who were trying to be trendy. Very boys’-own-adventures stuff I seem to remember. Think this tale might inspire me to have a go. From that wild envelope of green to those mummified drivers and rotting (love that word!) corpses is quite a spine-tingling leap, but at the same time the whole piece feels grounded in a believable reality. Really like the walking to forget. Ah, teenage sons… My son wasn’t into horror but I now look back quite nostalgically to those hours we spent watching the entire collection of Rocky movies. MJ – You have me grinning imagining the days when I fondly recall zombie uprisings. You should give it a go in that post-apocalyptic world. I was surprised what I found there. If I’ve learnt one thing in this life, it’s never turn your back on a mummified driver. Enjoyed the set-up you’ve done here of some sort of horrific, post-apocalyptic world. I can imagine the scene so well, and the feeling of “normality” as opposed to horror when she’s on the tracks and can’t see the devastation and mummified corpses. Just as I was starting to crave the smell of dryer-fresh socks, the scent of death began creeping in. The kudzu taking over reminded me of that series 100 Years After Man. Well done. I was thinking post-superplague, but there aren’t many around to know for sure. Thanks for the visit!